Abishek. 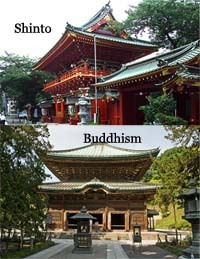 "Difference Between Shinto and Buddhism." DifferenceBetween.net. September 28, 2017 < http://www.differencebetween.net/miscellaneous/difference-between-shinto-and-buddhism/ >. Correction: according to Professor Hajime Nakamura, Shinto also comes from India (hinduism).